We have been having some work done on our home. Our goal is make our home a warm and inventing place to host guest. The kitchen makeover was stage one in the process. We had the kitchen walls painted a deeper red, quarter round placed along the floors to finish them out, and the cabinets taken from white to black. Since we can't afford to replace the cabinets a new paint job was in order for our 1978 cabinets. We had some repair work and new hardware put in place as well. 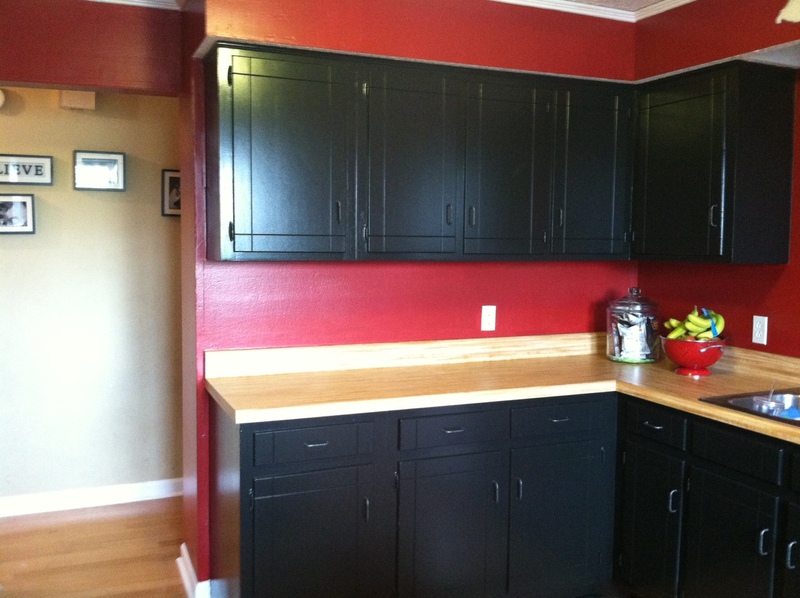 Here are some before and after photographs of the cabinets! I am so happy with the results of stage one! A giant thanks to our friend Jesse who did all the work, and helped us come up with a plan of action to get our home looking the way we envisioned. p.s. ignore the photography skills I am no pro, and got lots of glare from the sunshine on some of these. And After....notice the damage on both cabinet and wall is all GONE!! !